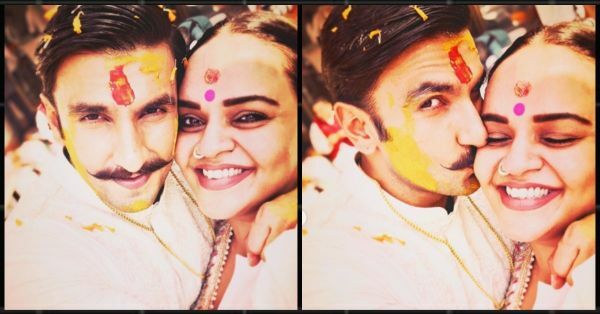 Ranveer's Haldi & More: The DeepVeer Wedding Guests Are FINALLY Sharing Pictures! The country's sweethearts, Deepika and Ranveer shared their wedding date(s) and place with the world on Instagram and we all went into a frenzy. However, the security at their venue was just too tight and phones weren't allowed so we got close to no pictures and videos from the celebrations. The couple finally put us out of our misery and shared two pictures from their Konkani and Sindhi wedding. The duo looked absolutely besotted and gleeful and it almost brought tears to our eyes. For the longest time, we waited patiently for more pictures and inside scoop to come out but to no avail. And now there are actually pictures that their teams, closest friends and families have shared. The guest list was limited to just 40-45 people so if you made the cut to DeepVeer's Lake Como festivities, you've gotta be special! Nitasha Gaurav, our Bajirao's stylist shared the photo on Instagram and sent the newlyweds lots and lots of love. 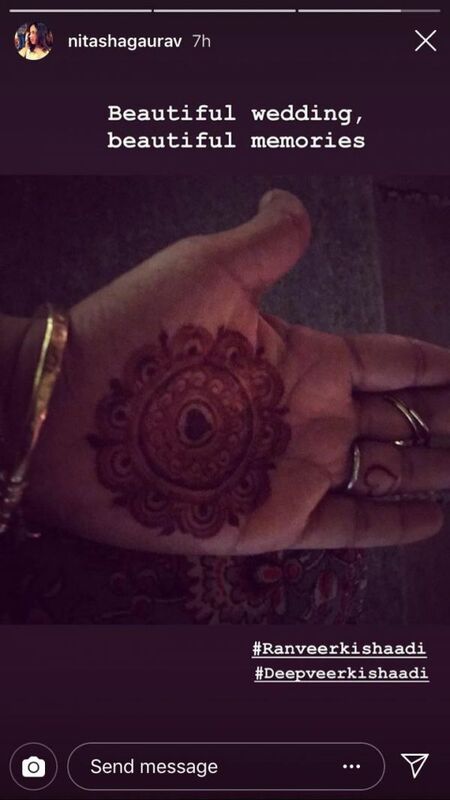 She even showed off her mehendi from the celebrations! Shanoo Sharma is one of Ranveer's closest friends in the industry and even cast him in his first film. That's right, she's the casting director responsible for the talent that's Ranveer Singh. Sharing pictures from his haldi ceremony she wrote, "From Band Baajaa Baaraat to Band Baaja Baraat....What a journey it has been to watch you grow from a boy to a magnificent man. I am so proud of who you were, who you are and who you are about to become. You are a responsible man who has loved and lived his word. May God bless you both with the most peaceful, blissful, mind-enhancing and Blessed path ahead! I love you most Ranno and I could not have imagined a more beautiful Life Partner for you than Deepika. Your life just got it’s biggest Award! Cherish it! Love to you both! Even though I couldn’t make it for your special day, thank you for the time and effort you made to make sure I was there to witness it all... This experience has been unforgettable..."
Side Note: Isn't Ranveer looking absolutely dapper in this white Sabya outfit!? Harshdeep Kaur posted a picture of herself from the Sikh ceremony and said that Deepika and Ranveer were "the most humble and gorgeous couple" she knows. 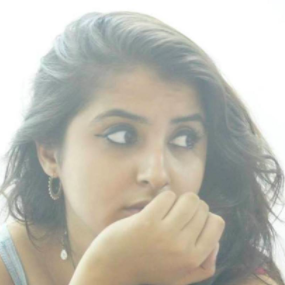 According to reports, she performed on their big day and Kala Sha Kala, Mehendi Hai Rachney Wali, Mehendi Ni Mehendi and Gur Naal Ishq Mitha are some of the hit numbers that she sang. Deepika and Ranveer's official wedding photographers were the Wedding Design Company team. They shared this photo looking bright and smiley with the couple. Wishing the couple the wrote, "We can’t thankyou enough for making us a part of every decision, big or small and welcoming us like family ❤️Thankyou for everything and a big congratulations to this wonderful WDC Bride and Groom 💑." Deepika's personal coach Nam posed along with Errikos Andreou who is the wedding photographer and the happily married couple. Nam posted the photo on Instagram, captioning it, "Congratulations. Thank you for having shared this incredible week with us. Wish you love & happiness forever. Peace." Designer Sabyasachi Mukherjee was also present at the festivities and he looked dashing in a red safa along with celebrity hairstylist, Georgiou Gabriel. The wedding was an intimate party but was one heck of a happy bash! We, just like the rest of the world are sending our fave Ram and Leela all the love and happiness that life has to offer.